The 12th Annual Tribute to JD concert is sneaking right upon us! Make plans to be a part of this year’s event for the 3rd time at Asylum in Portland, featuring some VERY SPECIAL GUESTS! With WBLM providing HUGE support again, we are again hoping for a great turn-out! With that being said, get your ticket(s) today and take advantage of placing your order early by getting FREE stuff! If you order your ticket(s) before May 31st, 2014 (ONLY through www.rustyrocket.com or directly to us through the mail), we will automatically mail you a coupon for $10.00 worth of FREE Raffle Tickets (per ticket)! 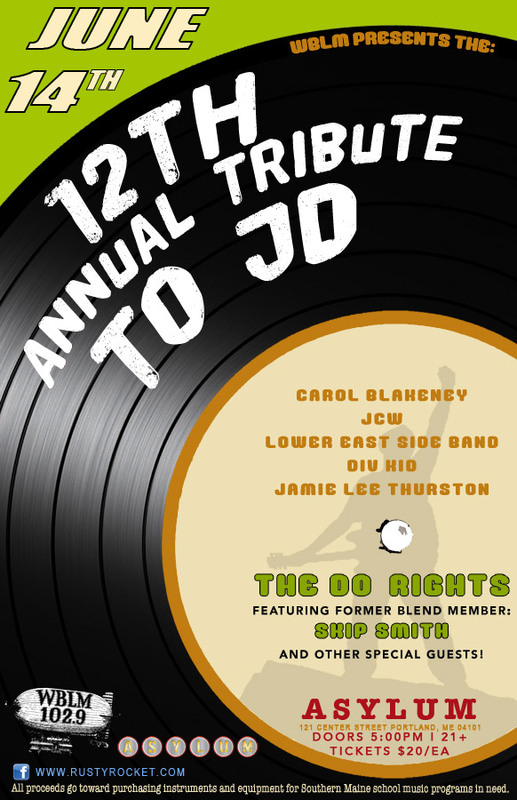 * Carol Blakeney * JCW * The Lower East Side Band * Div Kid * Jamie Lee Thurston * AND ON STAGE BY 9:00PM, JD'S FINAL BAND, The Do-Rights FEATURING Former Blend Member Skip Smith & some other very special guests! Please come join us on June 14th, 2014 and enjoy some great music to benefit an excellent cause! We will be selling lots of merchandise, including the new “12th Annual Tribute to JD” t-shirts for all of you who have been collecting them throughout the years! There will also be auctions and plenty of raffles for you all to enjoy! Food and drink specials will be available inside the venue, so you will be able to eat and drink WHILE enjoying the music! The attached Sports Bar at Asylum will also be available to everyone for more food & drinks as well! 4) Get them at Asylum the night of the show. Regardless, order your tickets before they’re all gone! 11th Annual Tribute to JD! The 11th Annual Tribute to JD concert is sneaking right upon us! Make plans to be a part of this year’s event for the 2nd time at Asylum in Portland, featuring some VERY SPECIAL GUESTS! With WBLM providing HUGE support again, we are hoping for a larger turn-out than last year! With that being said, get your ticket(s) today and take advantage of placing your order early by getting FREE stuff! If you order your ticket(s) before May 31st, 2013 (ONLY through www.rustyrocket.com or directly to us through the mail), we will automatically mail you a coupon for $10.00 worth of FREE Raffle Tickets (per ticket)! This year we are celebrating the CD release for The Blend – LIVE @ The Show Ring! Who doesn’t want to listen to some LIVE Blend music anyway??? *Death by Watermelon * The Lower East Side Band * WBLM Band * Div Kid*AND ON STAGE BY 8:30PM, JD'S FINAL BAND, The Do-Rights FEATURING Former Blend Member Skip Smith & some other very special guests! Please come join us on June 8th, 2013 and enjoy some great music to benefit an excellent cause! We will be selling lots of merchandise, including the new “11th Annual Tribute to JD” t-shirts for all of you who have been collecting them throughout the years! There will also be auctions and plenty of raffles for you all to enjoy! Food and drink specials will be available inside the venue, so you will be able to eat and drink WHILE enjoying the music! The attached Sports Bar at Asylum will also be available to everyone for more food & drinks, with a large projector screen showing the entire Tribute live! Rusty Rocket will also be providing bus transportation to and from the Kennebunk, Biddeford, Saco & Scarborough park & rides for FREE! So, take advantage and tell your friends - this is at no cost to you! We will post on our website and on Facebook the details of pick-up and drop-off times, as well as send the info via e-mail if you’ve provided that to us. There are 4 ways to get your tickets: Order them online here 24/7, mail in your payment along with this order form, order them at www.portlandasylum.com, or get them at Asylum the night of the show. Regardless, order your tickets before they’re all gone! Thank you and can't wait to see you at the show!